Nate Gerry didn't have to wait long to find out what the Eagles' plans were for him last year. After calling the University of Nebraska safety to inform him that they were about to take him in the fifth round of the 2017 NFL draft, they called him back five minutes later and informed him that, oh, by the way, they were switching him to linebacker. The position switch seems to be working out pretty well for Gerry. 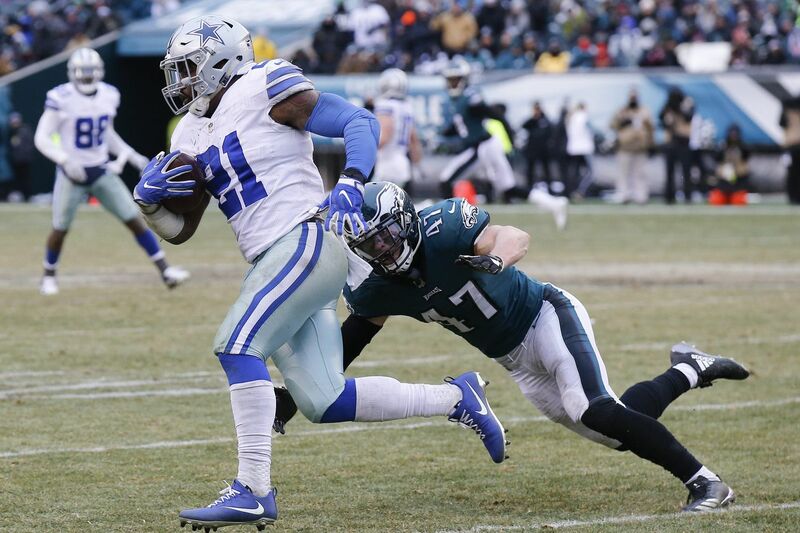 After earning his keep on special teams as a rookie, Gerry finds himself in the thick of the battle for the starting weakside linebacker job this summer, with Corey Nelson and Kamu Grugier-Hill, following Mychal Kendricks' release in May. Gerry, Nelson and Grugier-Hill have a combined six career starts – five by Nelson and one by Gerry, who started the Eagles' Week 17 game against Dallas. Regardless of which one wins the WILL job, all of them will be key components of Dave Fipp's special teams. Grugier-Hill led the Eagles in special-teams tackles last season. Gerry, who played in 10 games after spending the first six weeks of the season on the Eagles' practice squad, finished sixth. Nelson, who was signed by the Eagles in March, had been a special-teams standout with the Broncos. Gerry got a lot of first-team reps at all three linebacker spots during the Eagles' spring OTAs and is getting quite a few at WILL in the first two weeks of training camp. "That helped me tremendously,'' Gerry said of the spring reps. "We were down a lot of people in the spring. So, being able to understand all of the [linebacker] positions and get reps at all of the positions was invaluable. Defensive coordinator Jim Schwartz is a big proponent of versatility. He likes safeties who can play corner, corners who can play inside and outside, and linebackers who can play SAM (strong side), MIKE (middle), and WILL. Given middle linebacker Jordan Hicks' struggles to stay healthy – he has missed 20 of the Eagles' 51 games in his first three years – that's fairly important. In making the switch from college safety to pro linebacker, Gerry has had to master a new position and reshape his body. He weighed 215 pounds at the NFL combine before the draft and played last season at about 220. He added 10 pounds of muscle in the offseason. Gerry said he was on a 4,200-calories-per-day regimen and spent a lot of extra time in the weight room. "I still run,'' he said, "but not as much as I did at [defensive back]. You've got more space to cover [as a safety]. So, I wasn't running as much. Did more sprints and short-area drills and things like that, which are more conducive [to linebacker]. Even with the extra weight, Gerry said he's probably faster than he was as a 215-pound safety who ran a 4.58 40 at the combine. "The offseason treated me well,'' he said. Just watching him in practice, there's a night-and-day difference in his comfort level between last summer and this summer. He reacts to things faster. He takes better angles to the ball. He is better at slipping blocks. He is holding his own with bigger tight ends in coverage. "He's made huge strides,'' linebacker Nigel Bradham said. "The weight he's put on. The way he's learned each and every position. He's very versatile. You can put him at any spot. Kendricks was one of the league's most athletic linebackers, but he wasn't an instinctive player and never earned Schwartz's trust. Safety Malcolm Jenkins said he has been impressed by how effectively Gerry has made the safety-to-linebacker switch. "He hasn't looked out of place since he's been here,'' Jenkins said. "It's looked like it's his natural position. I think it's a good move for him and for us.